Dice the red onion and garlic. Throw into large pot on medium heat to sweat for about 2 minutes. In the can, mash up about half the navy beans. Then throw into the pot, stirring occasionally so they don't burn, again for about 2 minutes. Add the ground round and let cook for another 5 minutes, stirring occasionally. It's go time! Add everything else, turn on to medium/low heat and cook for 20ish minutes, stirring occasionally and spicing to taste. That's all, easy-peasy. 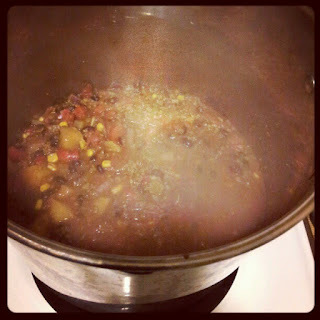 Chili with a tropical twist (and yes, John Conklin, you can add guacamole after to give it yet another twist).